Before he led the Cougars to victory in the Valero Alamo Bowl, Washington State Football Coach Mike Leach fulfilled a life-long dream to visit the Shrine of Texas Liberty. Mike Leach isn’t just a legendary football coach, he is also a self-professed history enthusiast and a best-selling author. He has co-written two books, Geronimo: Leadership Strategies of an American Warrior and Swing Your Sword: Leading the Charge in Football and Life. As a history-enthusiast, Coach Leach has extensive knowledge about Alamo history, including the early Spanish mission period. This allowed Leach to discuss topics like military tactics, geology, and the mission period during his tour. Alamo Staff member Kolby Lanham, who conducted Coach Leach’s tour, was impressed by the Coach’s wealth of historical knowledge. 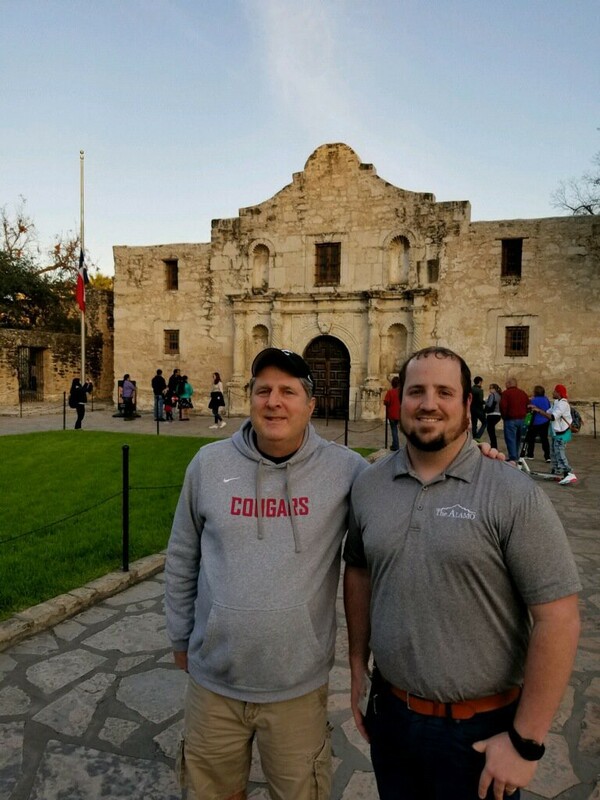 “Normally, the 300-year story of the Alamo can be difficult to tell in a one-hour tour but it was obvious to me that Coach Leach had done his research and had a good grasp on the history of our site,” Kolby said. “Because of his knowledge, we were able to talk about more in-depth topics such as what the trajectory and velocity is of an 18-pound cannonball, the conservation efforts we’re undertaking on the church, and our historic cannons. In my six years of working at the Alamo, this was one of my favorite tours that I’ve had the privilege to give,” Kolby added. Coach Leach said he finds the upcoming restorations to the Alamo as part of the Alamo plan to be exciting, including the reclaiming of the 1836 battlefield. “The Alamo is outstanding,” Coach Leach told reporters. “It’s impressive to hear about the potential renovations they might be doing because of the magnitude and how big that space was,” he said. Coach Leach would go onto lead the Washington State Cougars to a 28–26 victory over the Iowa State Cyclones in the Alamodome just a few days after his visit. We would like to thank Coach Leach for taking the time to visit the Alamo and congratulate the Cougars on their victory.